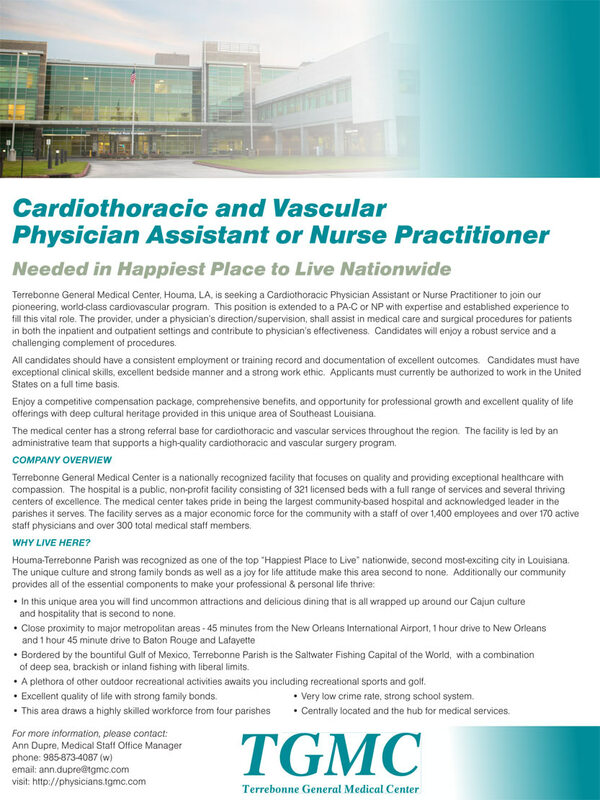 Terrebonne General Medical Center, Houma, LA, is seeking a Cardiothoracic Physician Assistant or Nurse Practitioner to join our pioneering, world-class cardiovascular program. This position is extended to a PA-C or NP with expertise and established experience to fill this vital role. The provider, under a physician’s direction/supervision, shall assist in medical care and surgical procedures for patients in both the inpatient and outpatient settings and contribute to physician’s effectiveness. Candidates will enjoy a robust service and a challenging complement of procedures. All candidates should have a consistent employment or training record and documentation of excellent outcomes. Candidates must have exceptional clinical skills, excellent bedside manner and a strong work ethic. Applicants must currently be authorized to work in the United States on a full time basis. offerings with deep cultural heritage provided in this unique area of Southeast Louisiana. The medical center has a strong referral base for cardiothoracic and vascular services throughout the region. The facility is led by an administrative team that supports a high-quality cardiothoracic and vascular surgery program. Terrebonne General Medical Center is a nationally recognized facility that focuses on quality and providing exceptional healthcare with compassion. The hospital is a public, non-profit facility consisting of 321 licensed beds with a full range of services and several thriving centers of excellence. The medical center takes pride in being the largest community-based hospital and acknowledged leader in the parishes it serves. The facility serves as a major economic force for the community with a staff of over 1,400 employees and over 170 active staff physicians and over 300 total medical staff members. Houma-Terrebonne Parish was recognized as one of the top “Happiest Place to Live” nationwide, second most-exciting city in Louisiana. • In this unique area you will find uncommon attractions and delicious dining that is all wrapped up around our Cajun culture and hospitality that is second to none. • Bordered by the bountiful Gulf of Mexico, Terrebonne Parish is the Saltwater Fishing Capital of the World, with a combination of deep sea, brackish or inland fishing with liberal limits. • A plethora of other outdoor recreational activities awaits you including recreational sports and golf. • Excellent quality of life with strong family bonds. • Very low crime rate, strong school system. • Centrally located and the hub for medical services.